Marshall Institute came to PINT in need of a website redesign that would effectively communicate a newly established brand identity. In the process, PINT discovered that Marshall Institute had an opportunity to vastly improve business logistics using third party software to manage the business’s events and seminars. 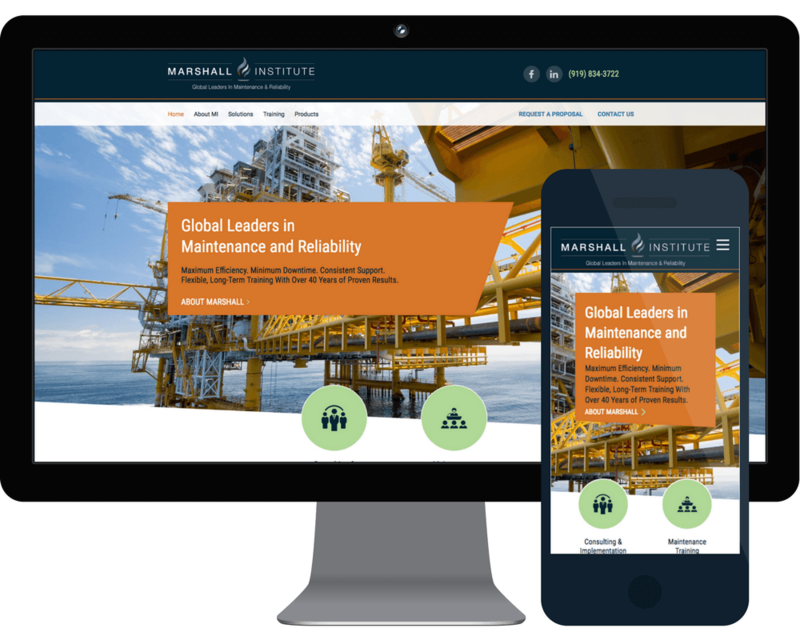 PINT’s expertise in both web development and software integration was put to the test for Marshall Institute’s redesign. Marshall Institute is an asset management consulting and training company dedicated to helping companies improve the maintenance contribution to their organizational performance. For over 42 years, Marshall Institute has been training maintenance and reliability professionals, helping to increase personal value and productivity. Marshall Institute initially engaged with PINT on a Website Redesign project. The existing website was outdated in terms of its brand identity, lacking in modern web trends, and not using a mobile-friendly design. The website redesign project included an initial User Experience & Information Architecture Discovery phase. During this discovery phase, PINT found that Marshall Institute was using an outdated, highly-customized software system to manage seminars and events, and the resources (trainers, materials, etc.) used during those seminars. Recognizing that there was more opportunity to help improve Marshall Institute’s business processes outside of the website, PINT suggested an additional Technical Discovery phase to investigate third-party software solutions available to replace Marshall’s existing proprietary systems. 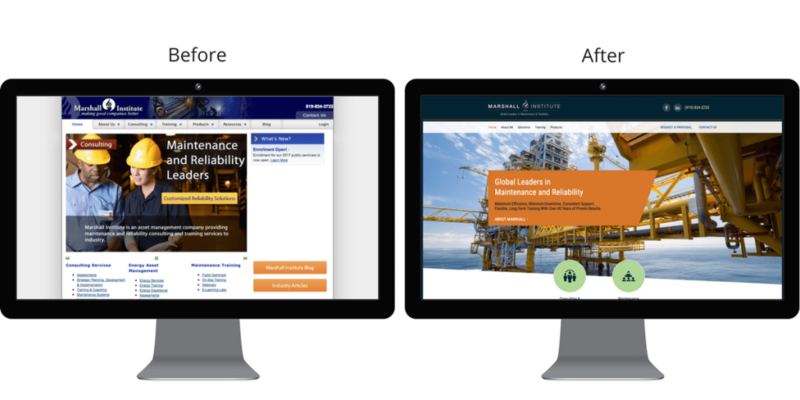 During the initial discovery phase, PINT’s Information Architect synthesized data gathered from internal stakeholder interviews, customer surveys, and a set of tree tests to determine how to most effectively present content on the new website. This also ensured that all business elements were accounted for prior to moving the project into the design phase. Taking the deliverables from information architecture, PINT’s design team took the structure and wireframes and built upon that to incorporate modern visual design along with Marshall Institute’s existing branding guidelines to create home and subpage composites. Combining design elements, brand colors, typography, imagery and iconography, PINT delivered a design that was engaging while making sure to deliver on the goals that both Marshall Institute and the website’s users are looking to achieve. The website was designed to be well thought out across all different screen sizes, from large desktops down to mobile devices, to make sure that all important user interface elements were clear and easy-to-use, delivering a great experience for the end-user. In the Technical Discovery, PINT’s Solutions Architect spent some time with the Marshall Institute team learning about the existing platform for managing seminars, how the internal ecosystem was working, and the most important components of the existing platform. This allowed the Solutions Architect to map out the key features needed in the new solution. PINT’s Technical Discovery yielded several potential solutions for replacing Marshall Institute’s existing seminar/event management system. Ultimately, PINT and Marshall Institute decided that Arlo’s Seminar Management software would be the best fit. This platform was cost-effective, offered a robust API for website customization, and integrated nicely with several payment processing options. The Marshall Institute presented some desire for a traditional CMS (content management system) along with this website redesign. Their existing workflow was to make updates to a static website. Our discovery research determined that the majority of their website updates were happening to the seminars (adding/removing etc). This opened up the opportunity to leverage Arlo’s API to import seminar content from the Arlo platform to the website, functionally acting like a traditional CMS for the seminar sections of the website. Why build a static website? PINT recommended that Marshall Institute build the new website as a static site for a few reasons: site speed, flexibility, and overall project turnaround. A static website does not carry the baggage of a robust CMS that is managing its content and layout, allowing the site to respond much quicker to user requests. Furthermore, a static website allows for much more flexibility, whether that be with hosting, integration with third-party tools, or manipulation of site layout. Building a static website takes much less time than incorporating a custom design into a chosen CMS. With a tight deadline that only allowed for a month of turnaround from design approval to site launch, PINT and Marshall Institute agreed that a static site would be the best option. Marshall Institute’s newly redesigned site follows the latest web trends, reinforces the new brand identity, is mobile friendly, and meets all of the business requirements laid out in the discovery phase. Marshall Institute is now able to manage all of their resources, seminars, and operations related to training services via the Arlo platform. Using the newly implemented tool, Marshall Institute is able to add/remove, edit, and manage all of its upcoming public seminars. PINT’s development team also leveraged Arlo’s web API to allow updates within Arlo to dynamically update on the live Marshall Institute website, allowing the tool to function similarly to a CMS. Arlo has also helped automate many of the manual tasks in the old setup such as seminar notifications/reminders and resource management (updating trainers on logistics of a specific seminar, etc). Arlo even has an app that can be used by the Marshall Institute team to stay connected and informed. By leveraging modern, supported, third-party services, PINT’s team was able to solve Marshall Institute’s challenge of outdated, and highly manual systems. 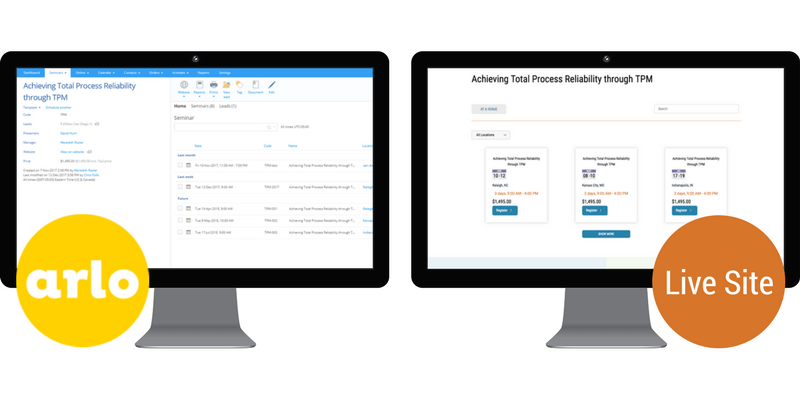 If your business is wasting time due to outdated, manual processes, PINT can help.